Each Ingo Maurer design was so unexpected, so audacious, so beautifully executed and tongue-in-cheek all at once. They quite simply make me happy just looking at them. The first time I saw the creations from German lighting designer Ingo Maurer, my heart raced. I stopped breathing, broke into a cold sweat. I might’ve even passed out for a minute. 1. His designs excite my inner tech geek. 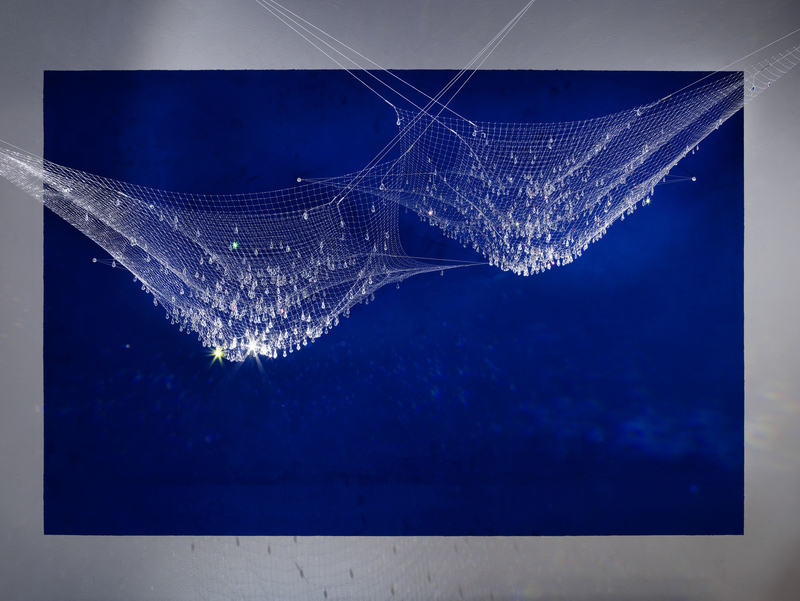 In my opinion, there’s nothing cooler than using science to create beautiful lighting designs. There are the unique holograms used in fixtures like the Wo Bist Du, Edison,…? Or using sheets of gold to create blue light in the 24 Karat Blau Pendant and Table Lamp fixtures. 2. Feathers, rubber and 24 karat gold. Not to mention soup cans and soda bottles. Considering Maurer’s creative designs, the use of surprising materials is actually not that big of a surprise. 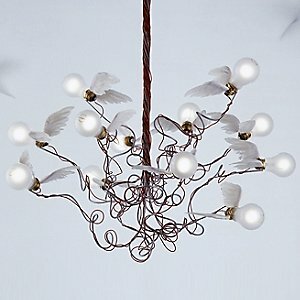 But they’re still a fun and unusual way to approach the design of lighting fixtures. 3. The logo is a flying light bulb. At first glance, the Ingo Maurer logo appears representative of Maurer’s irreverent view of the world. And so it is. However, it also shows that, while exceptionally innovative and technologically progressive, Maurer has great respect for traditional forms and sources of power. In a light-hearted way, the flying classic incandescent bulb shows how modern designs can soar on the wings of established tenets. 4. Ingo Maurer puts his designs into the hands of consumers. Many of Maurer’s designs require an owner’s input to create a final result. The MaMo Nouchies, for example, require manual folding and forming during installation. The placement of crystals and exact drape of the Lacrime del Pescatore’s various nets is also up to the owner. 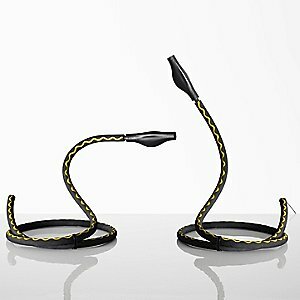 The Alizz Cooper “snakes” need to be individually coiled to send light in the right direction. Such hands-on participation helps create a particularly strong bond with the fixture and encourages a sense of fun and experimentation. 5. His name is Ingo Maurer. Even his name is distinctive and unusual, at least to my ears. Digging a little deeper I found that, as one might expect, Ingo is a German/Scandanavian name; it means “protected by Yngvi” (another name for Nordic god Freyr). This actually makes complete sense to me, as only divine inspiration could even begin to explain Maurer’s inexplicably creative mind.